"There’s a conspiracy going on here. Someone’s trying to burn me without evidence, and they’re hiding behind that tired old phrase, planetary security. This has nothing to do with security." President Keane from Darwood & Smitty. The winner did not respond. I tried a second winner who also did not respond. I'm excited about this, because who doesn't like a good conspiracy? Well, I guess none of us does when it's lined up against us. But in this case, we're talking about the political conspiracies faced by the world in 2045. The ones that Darwood and Smitty need to face. Only the police are from Jupiter and stand 16 feet tall. The politicians, believe it or not, are largely corrupt. Then there are the aliens from other solar planets. And still more from outside our system. And finally, of course, the corporations. Always with the corporations. So you know that almost no one has the good of the people in mind. Except ... except just maybe, some people are still willing to fight for what's right. Right? So today, I'd like to bribe you. Because that's how I roll. 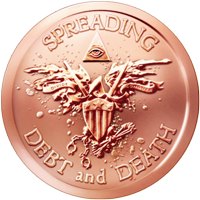 Pictured to the right is a 5-ounce copper coin featuring the world's beloved Illuminati and, if you believe it, their goal of spreading debt and death. It's a current symbol of what Darwood and Smitty are fighting against 30 years from now. October 24 is United Nations Day, and since so many people associate the UN with the Illuminati and a global conspiracy, I thought that was a perfect deadline. Buy the book, too, if you want to spread the conspiratorial love. And review it up on Amazon, you know? But a purchase isn't required to win the coin. Please note that, if you win, I'll need your name and mailing address for shipping the coin, and I'll need to announce your name (only) as the winner. so your chances of winning should be excellent! These are the boring rules that have to be listed for any sweepstakes in the United States, so bear with me. 1) Must be 18 or older and reside in the United States to participate in this sweepstakes. The coin will only be shipped to a valid U.S. address. 2) No purchase necessary to win. Simply subscribe to my newsletter by 11:59 p.m. EST on October 24, 2015 for your chance to win. Contest began running at 12:01 a.m. EST on September 11, 2015. 3) There is a maximum of one entry per person. Anyone caught creating multiple e-mail accounts to subscribe will be automatically disqualified from participating. 4) Prize is a 5-ounce copper "Illuminati" coin whose value varies with the copper market. Prize cannot be exchanged for any other prize or cash. Odds of winning depend on the number of mailing list members at the sweepstakes deadline. 5) Winner will be selected from my mailing list with a random number generator. My immediate family members (spouse, parents, siblings, children) may not win. By entering this sweepstakes, you agree that winner will be solely chosen by me, and that my selection is final. Winner will be notified no later than October 31, 2015 provided he or she is reachable at the e-mail address used to subscribe. If winner does not respond with a mailing address within one week, winner will be considered to have forfeited the prize and another winner will be selected and notified. This process will continue until a winner has provided a valid mailing address. 6) The winner must send an e-mail confirming my right to publish his or her name as the winner of the prize. This name will only be published by me on this page to validate that there was a winner. No other information about the winner will be revealed except as and unless required by law. 7) This sweepstakes is sponsored solely by me (Steve McCardell) and is not sponsored or otherwise endorsed by Facebook, Twitter, Google, or any other person or company despite where you may see it being shared. I can be reached through this website or through 145 S. Livernois; #201; Rochester Hills, MI 48307. Phew! I think that should satisfy the lawyers.